Towels – These would be the cutest little hand towels to set near your coffee spot in their kitchen or on your coffee cart! Cream and Sugar Set – These are the perfect way to jazz up any coffee area or coffee visit in your home! 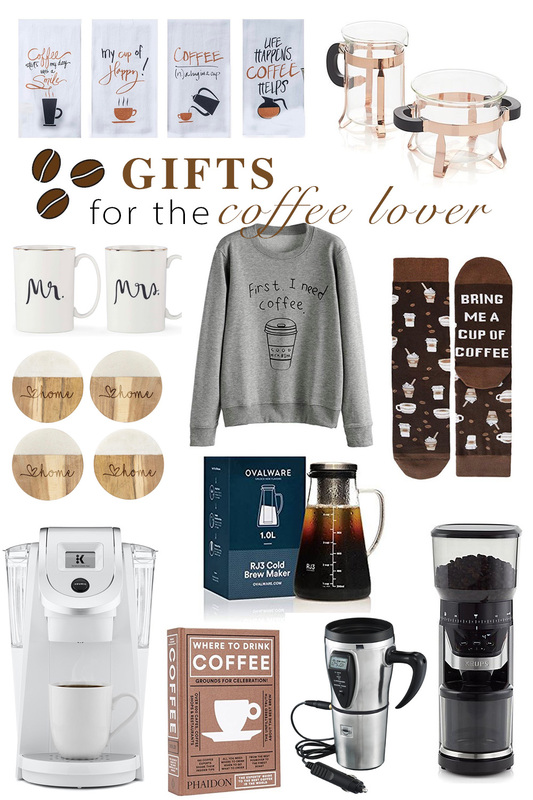 Mr and Mrs Mugs Set – What to get the newlyweds that love coffee! Coffee Sweatshirt – Cause we all need a coffee sweatshirt in life! Cold Brew Maker – Learn to make your very own cold brew in the comfort of your own home! Single Serve Coffee Maker – I am wanting to swap out our Keurig for this bright white one! Heated Smart Travel Mug – Plug it in, keep it warm and be on the go! Coffee Bean Grinder – One of the best selling grinders with great reviews!